How have guns affected your life? Have you ever lost a loved one due to a gun? Whether it is in school, out in public, at home or even from depression? 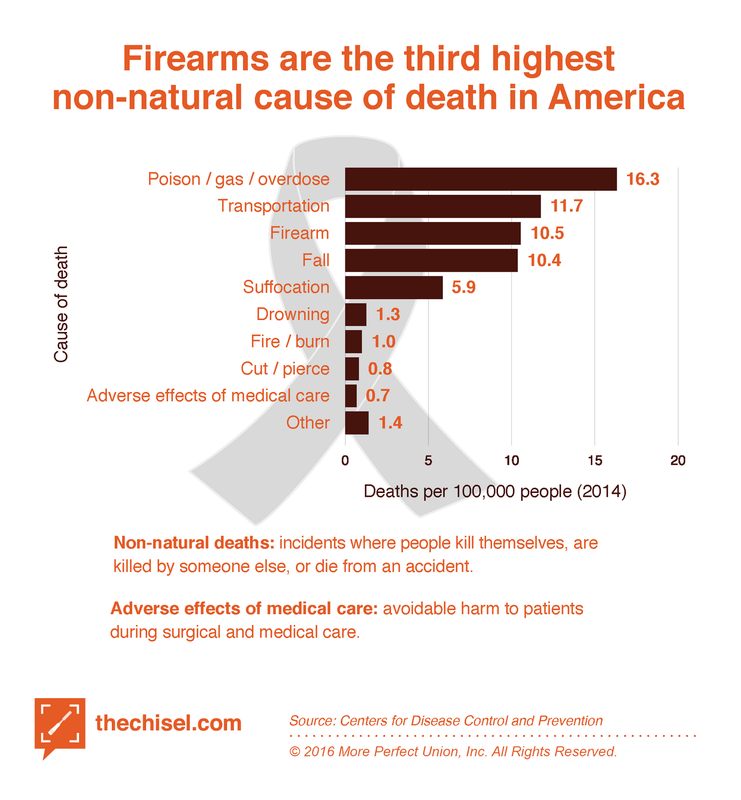 What is the root cause of gun violence in America? Mental health, bullying, too easy to purchase, or is it something else? I still firmly believe in the Second Amendment and the right to bear arms, but I would like to see the day that children aren't scared to go to school, because it's turning into a new war ground. I have never owned any gun myself, I have shot a gun before, and I know people who are close to me who have owned guns. I wake up day after day to see more school shootings around the world, and personally it is hard to sit by while watching innocent children die for doing nothing but going to school. I recently lost my older brother to mental illness and a gun, and it was very heartbreaking for me. Even though my brother was battling depression, he still passed a background check, and bought a gun in a matter of 2 hours. This is how gun violence has personally affected me, and it's my main influence for discussing it today. I'm working on the current gun control law issue that our country is currently facing. I believe that we can find a suitable compromise for gun laws that will satisfy both sides and allow children to feel much safer while at school. the percentage for death by guns has seen a big rise over the last few years, and the problem needs to be solved now, because it is already too late for some. It explains why there is a call for gun control in our country, it goes into the number of guns in the country, and even goes into the opposing sides of the gun debate in our country as well. Goldberg also discusses the impact from concealed carry in America as well. It goes into about every detail on gun control. This article, Epstein discusses some of the reasons as to why there is no easy solution to gun control. he goes into each idea of gun control prevention to talk about the flaws with each idea and why its a stretch. This article was researched and studied by The University of Rochester Medical Center regarding the human brain development. This article shows how adult brains and teen brains think differently. Johns Hopkins study of gun violence surveys emergency room admissions. If lost wages are added, ‘really startling’ costs rise to $45bn annually. Allegany College of Maryland is a high quality, low-cost educational community college with its main campus set in the mountains of Maryland's Allegany County and a branch location in Pennsylvania's Bedford County. Enrolling over 3,000 credit students and logging nearly 14,000 continuing education registrations per year, our small, attentive college atmosphere engages students of all ages and backgrounds. Whether we're preparing students for career entry, readying students for transfer, or simply helping individuals rediscover their personal interests, we prepare students for lives of fulfillment, leadership, and service in our diverse, global society. A lot of problems with creating gun laws in general is the fact that some gun owners can just privately sell their guns without background checks on etc... its one of the main ways around the process to gun ownership. By funding the CDC to study gun violence, this can help find the root causes for most shootings in our country. we know its not the guns fault, because the gun is useless unless its in the right/wrong hands. this will help us find out the root causes to these problems, which is a step in the right direction to solving these problems. Everybody should have to go through a UBC when planning to purchase a gun whether their reason for purchase be for sport, home security, hunting or just wanting to own a gun. this way we can check on that persons criminal history, we can check their medical history, and more to be sure that whoever plans to purchase the weapon is less likely to harm anyone with that weapon. to pass this you must have a psych evaluation, physical, and clean criminal record. after passing, you must wait for a 2 month "cool down time" to finally receive your purchased weapon. If people must prove themselves responsible enough to own and operate a car over an 8 month long period of time, they should have to take the proper steps and time to own and operate a gun as well. This course will beneficial, because it can teach you proper gun uses, how to operate properly and safely and this way we all know that anyone with a gun has had some kind of training to own a weapon. once this is passed, they can receive a gun license. I do not believe in fully banning any gun on the grounds of it being "too dangerous," because all guns if used in the wrong way can be seen as "too dangerous." People who want to buy bump stocks should have to receive and maintain their guns license with a clean record for 12-15 years before being eligible to buy a bump stock. this way we will know for sure that the people with the most dangerous of weapons are properly trained and have proven themselves to be responsible to own and operate a gun with added bump stock. This ban should be for obvious reasons known by all. 3D printed guns could be very dangerous for the public, because it makes it too easy to get a gun and if the wrong people start printing weapons for personal use or sales, this could south very quickly. A lot of the gun crimes we have seen on TV lately are usually committed by someone of younger age, less gun experience and still mentally incapable of owning a weapon. The reason I propose the age 25 to be the minimum age to purchase a weapon is because that is the average age the rational part of the human brain reaches full development. They say the way the adult brain and teenage brain works is completely different. The adult brain uses the prefrontal cortex to think, which is the part of the brain that thinks rationally, and for most people they'll think of the long-term effects as well. The teenage brain before full development at times can be rational, but they usually process information with the Amygdala. that is the emotional part of the brain which can often times make very irrational decisions. Unfortunately, we live in a country with people who have seen 2 sides of guns in this nation. You have those who grow up in the country using weapons to hunt, protect their crops/land or for other eligible reasons. Most the time these kids have a parent or two who have had guns for years and already know how to properly use guns, so they grow up with more respect for the weapon as a tool instead of just a killing machine. On the other hand, there are kids who grow up in the inner city who have seen people shoot each other in a drive by, gang war or for some other unknown reason. These people typically fear these weapons, because they have first-hand experience with how dangerous and harmful guns can be. This will help keep guns out of the hands of high school students, which can also make schools a lot more safe. It's no surprise that a lot of politicians want to ignore the gun issue we are currently facing in this country. they are making so much money from the NRA by passing weak gun laws that they know wont work, and they get a check for staying silent on an important topic for just saying "thoughts and prayers." This ban will force politicians to deal with these problems because they won't receive hush money from the NRA anymore, or else they'll just be voted out of their respective offices. Children will feel safer when in school, because the kids are the main reason we are making these laws, since us adults have failed our nation and most of us have forsaken ourselves. to protect the children of our nation is the best investment we can make as of now in history. Of course it will take time to see results in any plan, but this plan should filter out the sales of guns to bad owners to decrease the gun violence rate in our country. If either side refuses to reach any kind of compromise soon, that could eventually lead to a gun ban nationwide for all people, which will cause even more problems if not another civil war in our country. Let's say the budget is 10mil. Then we can use taxpayers' money to cover 5 mil of the money, with weed dispensaries becoming more legal, we could use half of the tax money received from that on deduction and the other half on this gun plan. That would make up to around 3mil more. That leaves 2 mil. which can be covered by savings from hospital care (due to lower gun violence) and use that on this plan which would be around another 1 mil. That's a total of 9 mil covered in this plan, and we can receive the other 1 mil through donations, programs and fundraisers worldwide through school programs and etc. Now keep in mind this is a metaphorical budget for this plan, so it is not foolproof, but i believe it can be a plan that could work. Thanks for your ideas and I’m very sorry about your brother. Your suggestions are generally sensible. However you have many of them, and each one needs to be carefully and individually scrutinized for constitutionality and effectiveness. As you know, sometimes the knee-jerk reactions produce suggestions that appear appropriate at first but which, after closer examination, can have unintended negative side effects or may not produce the intended results, or both. So I’d like to focus on your reason for starting this initiative, the fact that your brother was able to pass a background check in two hours in spite of his depression. And I’m assuming he killed himself with that gun and that his depression was a contributing factor. So the first question is, would he have killed himself if he hadn’t gotten a hold of a gun? The chart you cited suggests that the US has a higher rate of suicide by gun because we have more guns, and that if we didn’t have guns, we’d commit suicide using other methods like hanging or suffocation, as they do in other countries. And I think it’s fairly intuitive that if you want to kill yourself, there are many ways to do so, and so taking away guns doesn’t solve the suicide problem. So we can probably say that he killed himself because he was depressed and not because he was able to obtain a gun. So while I agree that a depressed person should not have access to a gun, especially that quickly, I’m not sure how useful such measures would be at reducing suicide. I do think, however, that ready and affordable access to good therapy and medications could help many of those folks not be driven to that point. This would be a lively topic and has nothing to do with guns, so we’ll move on. Only a tiny fraction of the remaining gun deaths are due to mass shootings, and yet I think the latter is what most of us are concerned about and would like to curtail, especially because it seems so random and unmotivated and also more easily managed by diminishing the firepower accessible to the perpetrators. Now, since “84% of mass shooters obtained their weapons legally”, it does suggest that it’s NOT necessary, as many say, to just “better enforce the laws that are already on the books”. We seem to need new laws. So here’s where I need more data. What kind of background test could have identified the typical mass shooter? How many of them had histories of mental illness or drug use? Or police records? If neither, then pushing for background checks for mental illness and police records is not likely to help. So we need stats on this before we can draw conclusions on this suggestion. Now, if we grant that they found a way to get a gun legally and had no history of mental illness, substance abuse, or criminal records, then what else could we do curtail mass shootings? This is where people start talking about banning rapid-fire guns. I’m specifically avoiding the term “automatic” because many people are eager to try to explain technical differences between automatic, semi-automatic, bump-stocks, etc. None of that discussion is productive because it’s a diversion. What matters is how fast you can shoot. So I use the term “rapid-fire guns”. So, should rapid-fire guns be banned? I’m not sure I’ve heard a good use-case for such guns as a form of personal protection or for hunting. I’d like to hear the justifications. But such a ban does appear that it could certainly have reduced the severity of several of these mass shootings. Besides knives, sometimes vehicle-ramming and bombs are sometimes used for mass killings. So, once again, as for the guns-and-suicide question, it challenges us to get to the root of the issue. So I need to get data to help us understand if the mass-attacks would likely be reduced by adding gun control measures, or if that would simply be an expensive and divisive red-herring. If anyone can share that, it would be helpful. Speaking of the root cause, I hear very few people talking about this. WHY do we have these mass killings? Why are people doing what they’re doing? WHY is it happening more now than before? WHY does it happen more in some societies than others? This may be a more difficult question to answer than just trying to make ignorant suggestions like we should ban anything with a “pistol grip”; but it seems to me that with 300M people in this country, many of them very smart and well funded, we should be able to get answers to this and have them available online so that social media can help educate the masses. Thanks for this discussion, and I’m looking forward to the replies! Thanks for your ideas and I’m very sorry about your brother. Your suggestions are generally sensible. However you have many of them, and each one needs to be carefully and individually scrutinized for constitutionality and effectiveness. As you know, sometimes the knee-jerk reactions produce suggestions that appear appropriate at first but which, after closer examination, can have unintended negative side effects or may not produce the intended results, or both. So I’d like to focus on your reason for starting this initiative, the fact that your brother was able to pass a background check in two hours in spite of his depression. And I’m assuming he killed himself with that gun and that his depression was a contributing factor. So the first question is, would he have killed himself if he hadn’t gotten a hold of a gun? The chart you cited suggests that the US has a higher rate of suicide by gun because we have more guns, and that if we didn’t have guns, we’d commit suicide using other methods like hanging or suffocation, as they do in other countries. And I think it’s fairly intuitive that if you want to kill yourself, there are many ways to do so, and so taking away guns doesn’t solve the suicide problem. So we can probably say that he killed himself because he was depressed and not because he was able to obtain a gun. So while I agree that a depressed person should not have access to a gun, especially that quickly, I’m not sure how useful such measures would be at reducing suicide. I do think, however, that ready and affordable access to good therapy and medications could help many of those folks not be driven to that point. This would be a lively topic and has nothing to do with guns, so we’ll move on. Only a tiny fraction of the remaining gun deaths are due to mass shootings, and yet I think the latter is what most of us are concerned about and would like to curtail, especially because it seems so random and unmotivated and also more easily managed by diminishing the firepower accessible to the perpetrators. Now, since “84% of mass shooters obtained their weapons legally”, it does suggest that it’s NOT necessary, as many say, to just “better enforce the laws that are already on the books”. We seem to need new laws. So here’s where I need more data. What kind of background test could have identified the typical mass shooter? How many of them had histories of mental illness or drug use? Or police records? If neither, then pushing for background checks for mental illness and police records is not likely to help. So we need stats on this before we can draw conclusions on this suggestion. Now, if we grant that they found a way to get a gun legally and had no history of mental illness, substance abuse, or criminal records, then what else could we do curtail mass shootings? This is where people start talking about banning rapid-fire guns. I’m specifically avoiding the term “automatic” because many people are eager to try to explain technical differences between automatic, semi-automatic, bump-stocks, etc. None of that discussion is productive because it’s a diversion. What matters is how fast you can shoot. So I use the term “rapid-fire guns”. So, should rapid-fire guns be banned? I’m not sure I’ve heard a good use-case for such guns as a form of personal protection or for hunting. I’d like to hear the justifications. But such a ban does appear that it could certainly have reduced the severity of several of these mass shootings. From here we hear arguments about how people will find other ways to mass-kill people if they don’t have guns. There was a mass knife-stabbing incident recently, I believe. Here’s one: https://en.wikipedia.org/wiki/2016_Sacramento_riot And here are others: https://en.wikipedia.org/wiki/Category:Mass_stabbings Besides knives, sometimes vehicle-ramming and bombs are sometimes used for mass killings. So, once again, as for the guns-and-suicide question, it challenges us to get to the root of the issue. So I need to get data to help us understand if the mass-attacks would likely be reduced by adding gun control measures, or if that would simply be an expensive and divisive red-herring. If anyone can share that, it would be helpful. Speaking of the root cause, I hear very few people talking about this. WHY do we have these mass killings? Why are people doing what they’re doing? WHY is it happening more now than before? WHY does it happen more in some societies than others? This may be a more difficult question to answer than just trying to make ignorant suggestions like we should ban anything with a “pistol grip”; but it seems to me that with 300M people in this country, many of them very smart and well funded, we should be able to get answers to this and have them available online so that social media can help educate the masses. Thanks for this discussion, and I’m looking forward to the replies!